It’s fairly easy to find a well written book or online article. But it’s not always easy to find one with genuine value that you connect with. That’s because, these days, books and online articles are a dime a dozen. There are literally thousands of them written on the same topic every year. So deciphering the ‘good’ from the ‘great’ can prove to be quite a challenge. But if you look hard enough, in the right places, you’ll find a few gems containing life-altering advice that can be immediately implemented and used as an instrument for self-improvement. For this reason, I’ve compiled the following list of books and online articles containing value so profound that each of them literally changed my life. I therefore extend my gratitude to the authors and pass them along to you with the simple hope that they will provide value to you as well. The Power of Now by Eckhart Tolle – Tolle’s message is clear: living in the now is the truest path to happiness and enlightenment. This book is carefully, thoughtfully and beautifully written. Not only does it illuminate the fundamental, slippery, destructive patterns of the mind or ego which confound one’s spiritual and even physical well-being, but it also provides a variety of simple and practical techniques for breaking down and dissolving these various forms of mental pollution. I use Tolle’s calming, contemplative techniques almost every day and they work wonderfully for me. The Road Less Traveled by M. Scott Peck– Pretty much the granddaddy of all self-improvement books, it’s easily one of the best nonfiction works I’ve ever read. By melding love, science, and spirituality into a primer for personal growth, Peck guides the reader through lessons on delaying gratification, accepting responsibility for decisions, dedicating oneself to truth and reality, and creating a balanced lifestyle. “Find what you love.” – 2005 Stanford Commencement Address by Steve Jobs – In his 2005 Stanford University commencement address Steve Jobs discussed three personal stories from his life. The advice he delivered was clear: find what you love, trust in your instincts, and follow your heart. Before reading Jobs’ speech back in 2005, I was struggling with a job I didn’t love because it was really the only thing I had ever tried. It was all I knew. Jobs says, “You’ve got to find what you love.” And his article helped me do just that. I finally realized that I was wasting my life living someone else’s dream. If I settled for someone else’s dream, I’d grow old and die without ever seeking my own. Advice, Like Youth, Probably Just Wasted on the Young by Mary Schmich – While the advice here is a bit more inspirational than it is practical, I have always enjoyed this short piece of literature. In the late 1990’s when I was in high school it became an international phenomenon when it was turned into a slow rock song by Baz Luhrmann (director of the 1996 movie Romeo and Juliet) that jumped to #1 on the U.S. and U.K. pop charts. The song was played at my high school’s class of 1999 graduation commencement ceremony. It eventually became famously known as “Wear Sunscreen.” Details aside, I still re-read it in it’s entirety from time to time when I need a quick dose of inspiration. Don’t Die With Your Music Still In You by Steve Pavlina– Above all, this short read taught me that “to abandon a comfortable lifestyle that isn’t deeply fulfilling is to abandon nothing at all.” It helped me understand that I was defending a comfortable, unfulfilling career without good reason. At the start of each workday, I was reluctant to get out of bed. At the end of each workday, the amount of satisfaction I received from the work I was doing was insignificant. Which in turn caused me to ask myself: Why should I stay loyal to such a meaningless job? So I switched it up and never looked back. Switch: How To Change Things When Change Is Hard by Chip and Dan Heath – A super great psychology book about real, concrete ways to make lasting change in both your personal and professional life. So many powerful insights, based on fact not theory. Inspiring counter-intuitive stories of huge organizational change against all odds. As they explain in the first chapter, “All successful changes share a common pattern.” I highly recommended this read for everyone. How To Become A Millionaire In Three Years by Jason L. Baptiste – Every once in a while I come across an online article I wish I had read ten years ago. This is one of them. It contains timeless advice on making money by building something of your own. Every wannabe entrepreneur should print this out, hang it on their refrigerator, and read it every morning. That’s what I did with it. Everything You Wanted to Know About Simplifying Your Life by Leo Babauta – This compilation of online articles has truly helped me simplify my life. Together, they cover everything from appreciating simple pleasures to decluttering your work space. These articles are about creating a simple life for yourself, which means getting rid of many of the things you do so you can spend time with people you love and do the things you love and value. If you’re looking to simplify your life, look no further. The Most Important Blog Post You’ll Probably Never Read by Glen AllSopp – If you’re even slightly interested in making money online as a blogger, website owner, etc., then this article is for you. It provides a short, insightful, bullsh**t free look at how to do just that. It really opened my eyes to perspectives on success that I wasn’t seeing clearly beforehand. Linchpin: Are You Indispensable? by Seth Godin – A linchpin, as Seth describes it, is somebody in an organization who is indispensable, who cannot be replaced—her role is just far too unique and valuable. And then he goes on to say, well, seriously folks, you need to be one of these people, you really do. To not be one is economic and career suicide. It is a book that reveals the truth about working for a boss, fitting in and following the rules. The only way to create a good life for yourself is to become indispensable and stand out. The Alchemist by Paulo Coelho – More parable than novel, “The Alchemist” uses the story of young shepherd Santiago’s search for his personal legend as an allegory for everyman’s struggle to break from the comfortable confines of conformity and pursue his life dreams. Along the way, of course, our young everyman is beset by numerous setbacks, testing his resolve and forcing him to become attuned to the Soul of the World in order to survive. By paying attention to the details in the world around him, which serve as omens guiding him towards his goal, young Santiago becomes an alchemist in his own right, spinning unfavorable circumstances into riches. I’ve read this tale a few times now, and it always provides priceless inspiration. 18 Things I Wish I Knew When I Was 18 by me – I know what you’re thinking. How did an article I personally wrote change my life? Well, it’s all about the soul searching that went into writing it. I had to dig deep within myself and seriously contemplate all the important lessons I’ve learned over the last ten years. In doing so, I noticed a few things that were out of place in my life, and I adjusted them. I can already directly attribute a few of my recent successes to the actions I took after I wrote this article. Can you think of a book or online article that changed your life? Please share it with us in the comments. This article was co-written by Marc and Angel and Shaun Boyd. The Demolished Man, by Alfred Bester, is a science fiction novel that was the first Hugo Award winner in 1953. I read it when I was a teen-ager. It showed me what I deeply cared about and how fascinated I was in exploring the depths of human consciousness. Years later, after I became an indepth psychotherapist, I realized that Bester helped me discover my authentic path. amazing list, i want to read the richest man in babylon soon!! Strangely, Four hour workweek by Tim Ferriss is not here, but I would definitely add it. Great collection! Thanks a lot for inspiring article. I didn’t read any of these books, so I need to try some of them. Btw… I recommend to add one more book to this collection. It’s “The 4-hour workweek” by Tim Ferris. It’s stunning. The Wisdom of Florence Shovel-Shinn. Beautiful book on being positive. I’ve read most of the things you’ve suggested, and I’ve added several to my list of “must reads.” I’m glad you included your own post on the list, Marc. I offer workshops for homeschooled teens, and I mentioned your post in one of my recent presentations, and I’ve added it to the list of “suggested readings” workshop handout. I agree with you that we can learn so much from the internal dialog we encounter during our own writing process. I’ve discovered many interesting and surprising things about myself that way. Superb list! Some of these books I know, and some I do not. I will check out one or two, and I will be sure to pick them up through your site’s links. Ideas and inspiration come from the strangest places, so reading/exploring a wide variety of things every week – for both business and pleasure – is key to enriching your life and helping you enrich the lives of the people around you. Thanks for this list – there are a few new ones here for me to check out. And I hope you all are having a productive Monday. Many many thank yous for including me on the list, it means a ton to me. I actually just shared this article on FB saying: “my writing helped changed at least one person’s life. mission accomplished”. Going through the other articles on here that I’m not familiar with as well. Thank you for providing these suggestions. I’d recommend The Five Secrets You Must Discover Before You Die. I read a page of it everyday before I go to bed. Changed my perspective on life. Everytime I find a list like this I always look for the same book, and I see it every time. The Alchemist is one of my absolute favorite books of all time. It can change the lives of anyone who reads it. I’m 17 now. I read the book 2 years ago in my World Literature class. Changed my life, I’m sure it can change anyone else’s. I recommend listening to the Psychology of Achievement and The strangest secret from Earl nightingale on top of Lead the Field. Takes these 3 audio tapes, with a blank mind. And you’ll write yourself a new future within the next 6 months. ‘The Way Of The Superior Man’ by David Deida is essential reading for any male. It has the power to totally change the way you act, think, love, and live the second you finish the last page. I recommend “Seven habits of highly effective people”, by Stephen Covey. Jeffrey Gittomer’s Little Red Book of Selling: The 12.5 Principles of Selling (aka)How to make Sales Forever…it is a sales guy read but there are items that you web entrepreneurs could use to make sales forever…It’s helped me. Anthony Bourdain’s Kitchen Confidential: Again geared towards the brick and mortar business model and primarily about the high end food industry (never eat fish on Tuesdays) but it teaches the lesson to have passion for what you do or get the hell out. It is also freaking a hilarious read to see what happens behind the doors of our favorite restaurants….and it has helped me kill time in airports. Sun Tzu The Art of War…many people have bought this book and I am sure it is on many of your book shelves…but have you read it and understand it from a business sense…It has helped me grow a business…twice…and succeed by knowing my (and my teams) strengths and weaknesses and how to grow and exploit a market share at a competitors loss. Another good one is “The Greatest Salesman in the World”. A book that has been out for ages. Thank you for this article! We included it in our Weekly 30 wrap-up. I really like number 9. I read a similar book called the Secret of the Millionaire Mind, and I love it. There are just a couple of things that we need to nail down before even dreaming of becoming financially free. Excellent. Some of these I’ve read, but others need to be on my list..fast! And here I thought I was running out of inspirational reading! I also recommend, “Dark Side of the Light Chasers” by Debbie Ford. It was one of those books that changed my life and outlook on things as I was going through a divorce. The 7 Habits of Highly Effective People by Covey is also a keeper. Hi Marc. You have some seriously great reads here. In fact, you have some of my all time favorites. How to Win Friends and Influence People is so awesome, even though the name throws some people off. I love that this book isn’t about manipulating people into liking you. It’s all about changing yourself & being genuine. My other favorite is The Power of Now. It’s full of sheer awesomeness. Thanks for this list–there were several books on there I wasn’t familiar with. I’d like to second Your Money or Your Life by Dominguez and Robin (mentioned in another comment). That booked really helped me clarify the trade-offs we make between money and time. Also, I’d suggest The Story of Stuff by Annie Leonard–a real eye-opener about where our stuff comes from and where it goes when we’re done with it. Wow, great list. I just put “Getting things done”, the audiobook, on my iphone, so I’ll take a listen today. Connected with some others on the list too. Thank you for sharing, I love reading posts about people’s favorite books and what they got out of them. Tolle, Godin, etc. – nice collection. Also I had the privilege of spending some time with Glen when he was in South Africa, and I know he writes some great posts. The Four Agreements written by Don Miguel Ruiz. I just finished this book right before I got online and read this post. It opens your mind to the true power and potential of the real reason that we are here- To love. Great Post! A good crystallization of the great advice, websites, books out there.. now if they could all be kindle ready! Thank you for the list, I am always very happy when people drop names of new books and articles that I haven’t heard of. I would also appreciate very much if you were to put together a list of books on time management that you have found very influential. I am with Ben re: The Four Agreements. Absolutely amazing. The book that most changed my life 180 degrees is #2 on your list… I was happy to see it there 🙂 Might be time to revisit that masterpiece again soon (The Road Less Traveled). I’ve read quite a few of these. Marc, these are all great. My all time favorite ‘The Road Less Traveled’ which was gifted to me 8yrs ago. It helped change my prospective on life. would be a good addition. I agree that The Four Agreements should be on this list. Great list and glad they helped you when you needed them. I have found in my own life, a great book often comes when I need it. Course In Miracles during my mother’s death. Conversations with God during a bad break up. Not sure if this is chicken or egg with me searching or one presenting itself, the Buddhist part of me hopes the latter. Four Agreements as others suggested (skip the peyote first part) and I hated Road Less Traveled. I know, a nation of one, but if i had to read the word “cathexis” one more time i was going to scream. Others seemed to connect with it as you did. My loss. Yes, I am an admirer of Eckhart Tolle as well. I went to a speech he gave in Germany last September. There was an atmosphere I never experienced before. I also liked some books of Osho. Some things he said changed my perspective on life quite heavily. I know he was kind of radical so he’s not everybody’s cup of tea. P.S. Marc, did you ever read something from Osho? The ’48 Laws of Power’ by Robert Greene is one that changed my life. Met Jason Baptiste, he was my sister’s roommate. Very cool to know he’s on this list. Awesome read! Have you read this one? 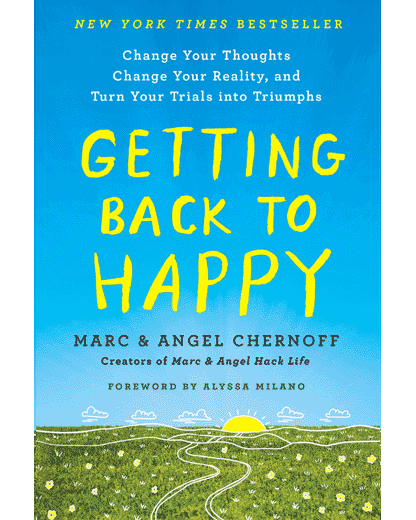 It totally changed my life–to be a happy one! So thankful for this post, especially since I am trying to become a successful website entrepreneur. I can’t wait to look over “the most important blog post you’ll ever read”! I recommend Rich Dad, Poor Dad for you guys to read. It helped change my financial life. many thanks for ur awesome list. i have read a few of these must read books. another book which i am going to add is The Monk Who Sold His Ferrari by Robin Sharma. Who moved my cheese & The Present – by Dr. Spencer Johnson are light reads. They’d take just an hour or so but would leave a lasting experience. Who Will Cry When You Die – Robin Sharma is also helpful if u wanna learn to stop prevaricating and start doing stuff.